Diabetic school children have to deal with a good deal of emotional stress, especially when they are first diagnosed. On one hand, they hate to appear different from their mates. On the other, they must keep their diabetes in control so they don’t suffer physi­cal consequences and end up in the nurse’s office, or worse, have to be picked up by an ambulance in the school yard. Luckily, after the first few weeks, this does not present a seri­ous problem because glucose testing and insulin injections can be done at home at breakfast, supper, and bedtime. Children should carry a SBGM monitor with them to school, which can be easily hidden in their backpacks or even stuffed in a pocket. That’s if they feel the need to hide it. Laura is a nurse in a middle school (sixth, seventh, and eighth grades) and in her many years of knowing diabetic young­sters, she has never seen teasing or discrimination from diabetics’ classmates. “The other kids are curious about the disease and the glucose monitor, but it’s not malicious curiosity. They just want to know. Once they understand what’s going on, they drop it. It’s no more out of the ordinary than wearing glasses or wearing a leg brace.” Laura said that the kids at her school seem to be nicer to each other than when she was young—and a lot nicer to each other than their parents are. An important parental task is dealing with school admini­stration and teachers. It is best to have these conferences in person after school so your child’s friends don’t see you there. The princi­pal and other administrators, as well as all of your child’s teachers and athletic coaches, must be told that your child has diabetes, and these adults need to understand what the disease is, what emergencies can arise, and what actions to take if they do. In addition to making known what you want from school authorities, you should extract a promise from them that they will keep your child’s diabetes confidential. For safety’s sake, you must inform the adults who are responsible for them during the day, but it would be entirely unacceptable for these people to “tat­tle on” your child and make him the object of derision in front of his friends and schoolmates. Your child is the only one who is en­titled to decide who to tell. Of course, most children cannot keep a secret, so when you discuss this issue with your child, be certain you say that two seconds after a friend is told, the entire school may know. Your child probably won’t believe you, but at least you have given the warning. On the other hand, you assuredly don’t want your child treated like an invalid or kept out of regular school activities. That is discrimination and federal laws exist to remedy it: Section 504 of the Rehabilitation Act of 1973, which protects people with dis­abilities against discrimination in any federally funded program, including public schools; and the Education for All Handicapped Children Act of 1975, which was amended in 1990 and is now called the Individuals with Disability Education Act. 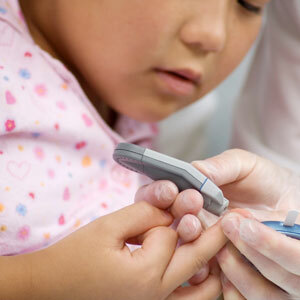 Diabetic chil­dren are specifically mentioned in the latter law because diabetes is considered a chronic health condition. According to the law, all public schools must accommodate the needs of diabetic children, and a specialized individualized education plan must be developed for each handicapped child. You should discuss the plan with school administrators and teach­ers so that it will be truly individualized for your child. Elements of the plan include: eating wherever and whenever it is necessary; trips to the bathroom or water fountain during class; participation in field trips and extracurricular activities; increased days of ab­sence; and assistance with blood glucose monitoring or insulin in­jections if the child needs it. If your child is being discriminated against in any of these ways, fight it. Begin in a low-key manner by going to school to find out if the administration knows what is happening; often the principal has little idea of what goes on in classrooms. If the ad­ministration does know but doesn’t care, step up your level of in­sistence on your child’s rights.